…my dreams. 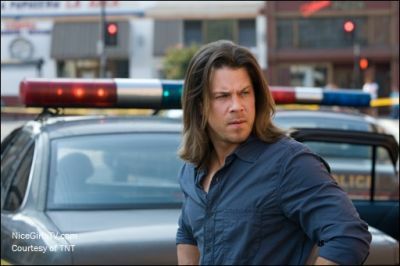 Well, to be honest, Eliot Spencer, the badass he plays on Leverage, is the one I dream about. Christian Kane cusses like a sailor, dips, and is seemingly never in one place for very long. These are not qualities I find attractive. But we hail from the same corner of the earth. He was born in Texas and raised in Oklahoma, I was born in Oklahoma and raised in Texas. I’ve lived part of my adult life in both states and most of my family is scattered throughout both. He and I have traveled the same roads, washed the same red dirt off our cars, and know more native American words than the average citizen due to Oklahoma geography. My assumption is we share a lot of the same values. He’s also a musician. When his EP came out some time ago, I bought it. My then 2 year-old daughter danced to “The House Rules” on first hearing, so I knew it was a good thing. I delayed, however, in buying his full album when it came out, because by then, my mid-life crisis had me firmly in its’ grips, and I couldn’t bring myself to listen to anything I thought might make me ache even more for the life I lived unfulfilled. Even after I bought it, many tracks went unheard for the same reason. Today was different. Today, my husband took our wee one to school, then we walked to downtown Long Beach, to a french bistro we discovered, and had the rare meal alone, just the grown-ups. We then walked down to the beach. Walking along the ocean brought back memories of when I first moved to California, and the walks I’d take along Dockweiler beach in Playa del Rey. I thought of the music I listened to back then, and pulled out my iPhone. I put one of the tracks on (Let it Whip, by the Dazz Band), just to reminisce, then, as we walked back up to Ocean, I decided to put on Kane’s album. For the record, listening to “The House Rules” while standing still at a crosswalk is VERY hard. I had to get a little hip-shakin’ in there. I had never listened to the second track, “Something’s Gotta Give” until today. I kinda laughed at myself, because these words spoke to me for reasons I’ve enumerated in many previous posts, yet I hadn’t allowed myself to hear them because I feared the feelings they’d stir up. In general, listening to country music makes me think of my summers in Enid, of driving up the 74, past the Kerr-McGee factory where Karen Silkwood worked (as pointed out by my grandfather EVERY TIME we drove past it), of boys in cowboy hats and baseball caps, with the nicest butts in denim I’ve ever seen. My husband and I danced to “Amazed” at our wedding, and that and the other country songs he put on a mix cd he gave me when we were first dating tend to bring tears to my eyes. But, otherwise, I haven’t really connected with a country song in a while. Not to say I’ll be getting these words tattooed on my arm or anything, but I find it amusing that once again I find that my fears have kept me from something meaningful. Yes, it’s just a song, but one of the most valuable things we have in this life is the ability to connect to other people. Music allows us to connect to others in a profound way. A well-written song can remind us that despite our differences, we often share the same feelings, the same concerns, the same desires. Rather than being hurt by these words, they inspired me, just a little. So thanks for that, Kane.